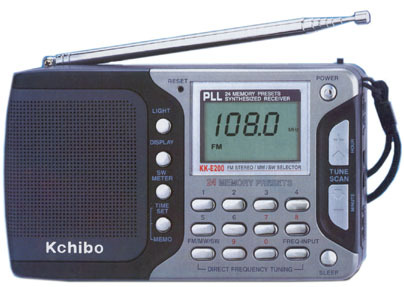 The Kchibo KK-E200 is a very feature rich radio for its price class. This digital radio tunes AM from 520 to 1620 kHz in 9 or 10 kHz steps. FM reception is from 87.5-108 MHz (stereo to earphone jack). Shortwave reception is from 2.3-7.3 and 9.5-26.5 MHz. Thirteen individual shortwave bands are selectable via the Meter Band function. The backlit LCD lets you view the frequency when tuning at night. You can tune this radio four ways: Up/Down manual tuning (5 kHz steps), automatic search tuning, direct keypad frequency entry and 24 memories. You can store 6 AM stations, 6 FM stations and 6 stations each on SW1 and SW2 bands. There is also a 24 hour digital clock with 10-90 minute sleep function and auto-turn off. The left side of the radio features a Local-DX sensitivity switch. The right side has a dial lock button. Click here to view functions. The radio works well with its telescopic antenna, but there is an external antenna jack. Requires three AA cells (not supplied) or 5 VDC 250 mA [center neg.]. Only 6 x 3.5 x 1.25 inches 12 oz. (150x90x35mm 340g). The Kchibo KK-E200 system comes with an AC wall adapter, wrist strap, vinyl carry case, stereo ear buds and wire type antenna.